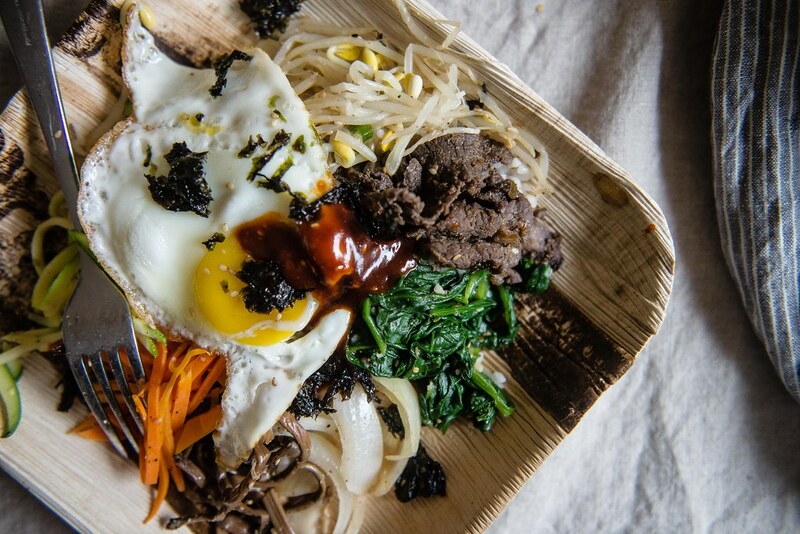 Bibimbap has always been my favorite thing to make for a bunch of reasons — it’s pretty much fail-proof, the gochujang sauce would make an old shoe taste delicious, all the components are mindlessly easy to put together. But this weekend I realized there are even more reasons that it’s fun and great for a crowd: it’s naturally gluten-free, vegetarian guests can leave out the bulgogi or you can panfry some tofu to provide a protein-rich alternative, and health-conscious friends can opt for quinoa or other heftier grains as an alternative to the rice. 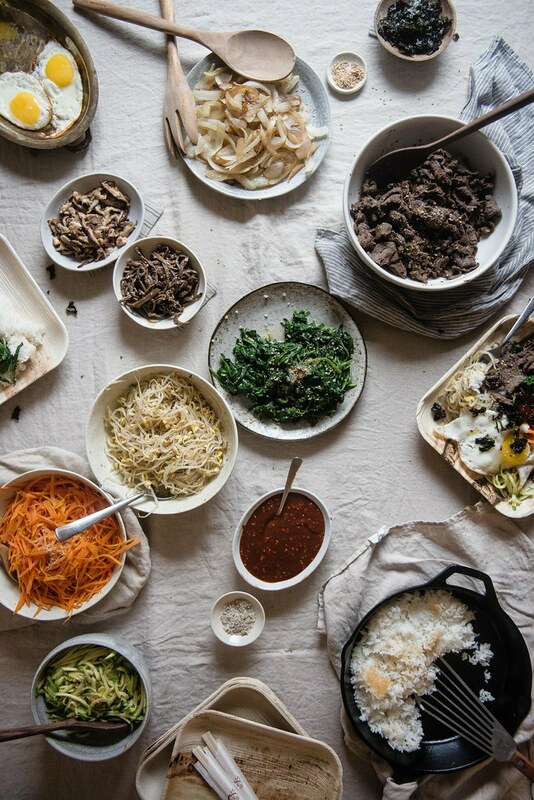 We didn’t have individual stone bowls for dolsot bibimbap, so to mimic the crackly sesame rice, I crisped up some rice in a cast-iron skillet, then we laid out beef bulgogi, dubu jorim, a truckload of veggies for everyone to choose from, and took a show of hands for how many sunny-side up and over-easy eggs to fry up right before people chowed down. A friend brought a nifty Korean-style quinoa salad with broccoli and kimchi to go with it; for dessert we devoured another friend’s maple pear upside-down cake that I’m still dreaming about. And I wore stretchy pants the whole time. There’s actually a recipe on the blog already for bibimbap (the first one I ever posted!) but it’s just for two — this one is scaled up for 8-10 instead, with a few more options for mix-ins and a couple of notes on how we tweaked it to serve a crowd. Hope you’re having wonderful Wednesdays! 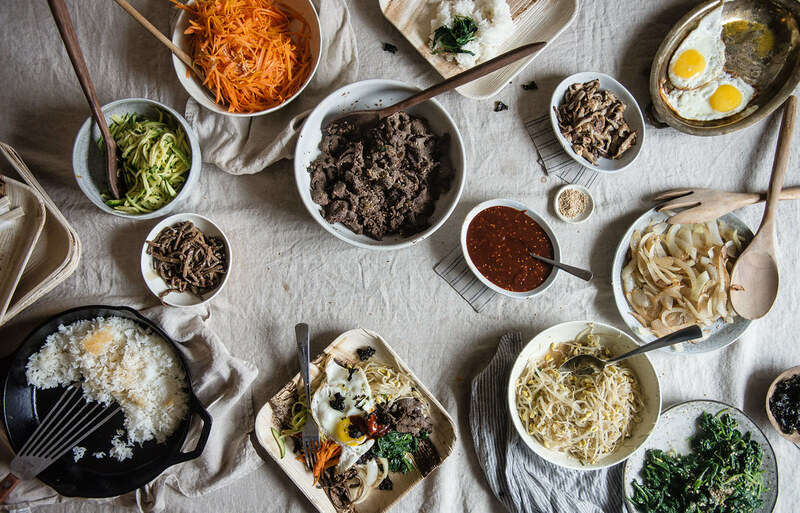 How to Put Together a Bibim-Bar! Bibimbap is one of my favorite things to make, both at home and for friends, because it's nearly fail-proof and tends to please almost everyone, as long as you like spicy food. 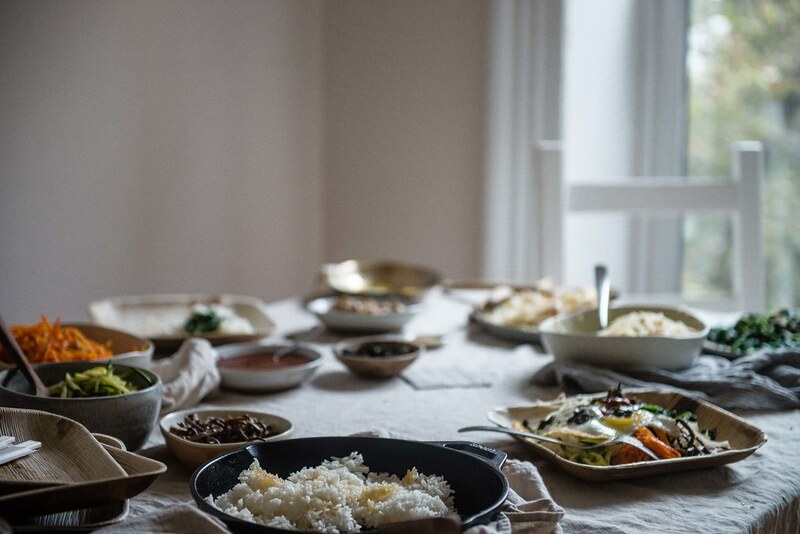 It's naturally gluten-free, vegetarian guests can skip the meat and still have a hearty meal (plus you can serve some tofu as a replacement -- we did my favorite, dubu jorim), and you can opt to serve quinoa or another higher-protein grain for those folks looking for an alternative to rice. Its only downside (other than the fact that non-spicy friends might be out of luck) is that the ingredients take a little while to put together, but you can always ask friends to pitch in and bring one of the mix-ins. The night before or at least one hour ahead: Marinate the meat of your choice. You can choose higher-quality cuts of beef traditionally used for bulgogi, like sirloin or ribeye, or you can simply go with ground beef for a crowd -- I like ground beef just as much a lot of the times, especially since it mixes nicely. Ground chicken, pork, or turkey will work well, too. For the marinade, combine pear (or apple), onion, soy sauce, sugar, sesame oil, and garlic in a food processor and blend until smooth. Combine with scallions, sesame seeds, red pepper flakes, and black pepper in a large, sealable container and adjust seasonings to taste. Add the meat and massage the marinade thoroughly throughout. Seal the container and chill in the refrigerator overnight, or at least one hour. 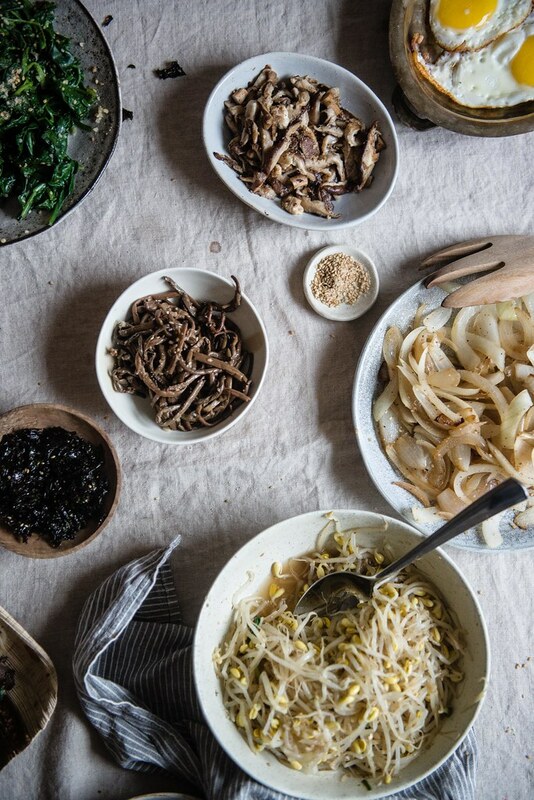 Make ahead or the day of: The bibimbap sauce is easy and can be made well-ahead, up to a few days in advance. Simply mix all the sauce ingredients together until well-combined, taste to adjust, and if you like, thin it with a bit of water to make it easier to mix. You can also cook the vegetables in advance, though I like to do it the day of -- chopping and preparing them ahead of time may also save some time. For the carrots, zucchini, onion, mushrooms, and fernbrake, simply heat up a bit of oil in a skillet, then sauté the vegetables (separately, one type at a time) with salt and pepper until tender. Carrots will take about 3-4 minutes, zucchini 1-2 minutes, onions 5-7 minutes, mushrooms 5-7 minutes, and fernbrake 1-2 minutes (or you can buy it pre-cooked at your local Korean market). You can add a touch of soy sauce to the mushrooms and fernbrake, if you like. Sprinkle each cooked vegetable with 1-2 tsp sesame seeds. For the soybean sprouts and spinach, bring a large pot of water to boil. Add the sprouts and simmer for about 10 minutes, or until softened. Remove the sprouts and rinse them with cold water to stop the cooking. Toss the sprouts with 2 tsp sesame oil, 1 tsp soy sauce, salt, pepper, and 2 tsp sesame seeds. Bring the water back to a boil and add the spinach. Cook the spinach briefly, just 30 seconds or less, until soft. Again, drain and rinse with cold water to stop the cooking, then toss the spinach with 1 tbsp minced garlic, 2 tsp sesame seeds, 1 tsp soy sauce, salt, and pepper. The day of: To cook the bulgogi, simply heat a skillet over medium-high heat, add just a bit of oil (if you're using non-stick, no oil is needed), and cook the meat in batches, taking care not to over-crowd the pan, until meat is cooked through. For me, this takes about 3-4 minutes per batch at most. Finally, just before the guests arrive, heat 1 tbsp sesame oil in a cast-iron skillet over medium-low heat. Add the rice to the skillet in an even layer. Let cook, without stirring, for 15 minutes, or until the bottom layer of rice forms a golden, crisp crust. The very last thing I like to do is fry the eggs, generally as people are arriving or are getting ready to eat. I find that people are pretty evenly divided between sunny-side up and over easy eggs for bibimbap, though almost everyone likes them a little bit runny inside. For sunny-side up, heat 1 tbsp oil in a non-stick or well-seasoned cast-iron skillet over medium-low heat. Crack the eggs gently into the skillet and let cook, without moving them, for about 1-2 minutes, or until whites are opaque. For over easy, gently flip the eggs after 1 minute of cooking (the whites can still be slightly translucent) and let cook for another 30 seconds to a minute. Serve the bar with rice first, followed by the proteins, vegetables, eggs, seasoned seaweed to top, and the gochujang sauce. 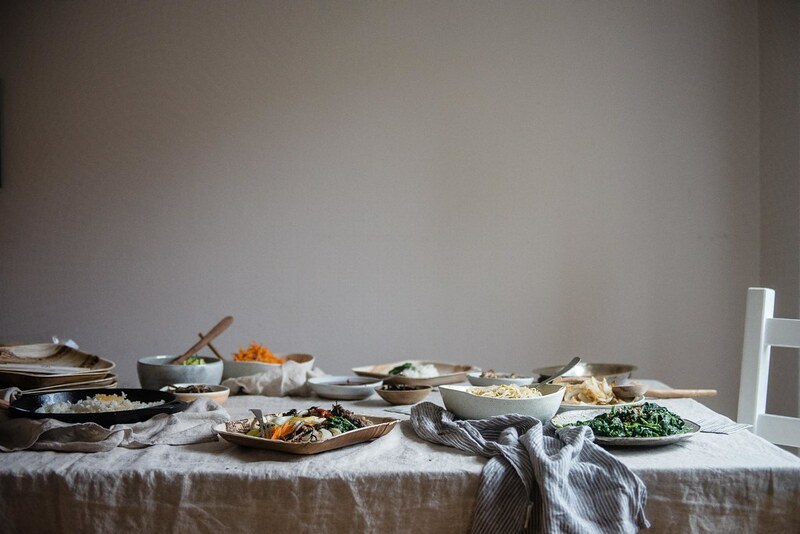 I think wide, relatively shallow bowls with at least a gentle rim are best -- deep, small bowls and flat plates tend to make things messy, at least for clumsy me. (These Verterra 8-inch plates and these Leafware ones worked great.) And enjoy! The proportions for the vegetables above are a rough estimate -- I found that carrots, bean sprouts, and spinach were more popular add-ins than zucchini, mushrooms, fernbrake, or onion, so I adjusted accordingly, but you might want to prepare extra just in case. 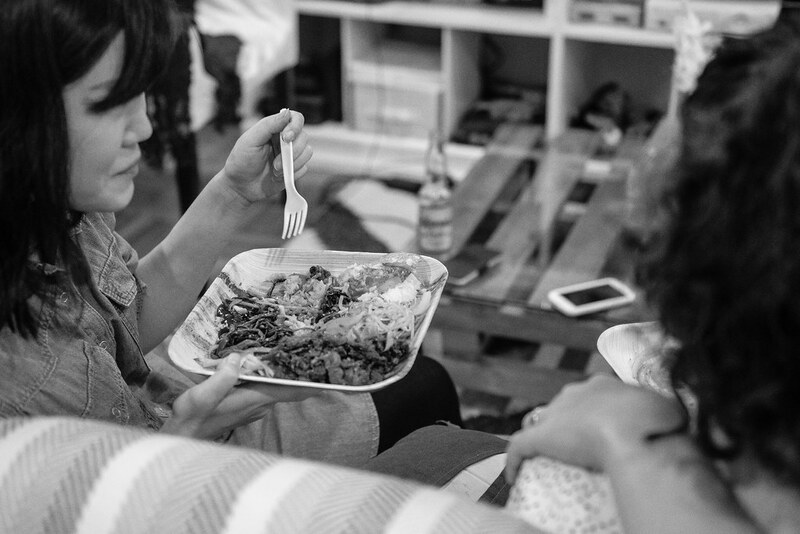 We found that one pound of bulgogi meat and 12 ounces of tofu were almost exactly enough for ten of us. If you find you have generous amounts of leftovers, the good news is that it all freezes well, so you can always pre-assemble any leftover bowls (minus the eggs) and freeze them for to-go lunches later on. Finally, I don't have one, but I imagine that a spiralizer would be really great for the carrots and zucchini, so that you don't have to julienne them by hand! OMG, this looks so amazing and so fun! We are having friends over this weekend and I had been trying to decide what to make and this deliciousness arrived in my inbox this morning! Fate!! One question on the veggies–if they are sautéed up before guests arrive, how do you keep them warm? or is it ok to serve at room temp? Thanks so much for your help, Cynthia! Hi Maureen! I was kind of stuck on how to keep the vegetables warm, too! The way we got around it was serving up the rice while still hot, since the cast-iron skillet retains heat pretty well (and we also had extra rice kept warm in the rice cooker), and serving the eggs as soon as they were done, so that those two could warm up the room-temp vegetables and beef when mixed in. But we also used microwave-safe plates in case anyone wanted to pop theirs in the microwave. Another thing you could do is arrange the vegetables in oven-safe glass dishes (I think a 9×13 dish would be large enough for most of the vegetables here) and cover with foil, then place in the oven at 200 degrees until ready to serve. Hope that helps and so excited you might try it this weekend!!! I’d love to hear how it goes if you do! Beautiful. That had to be an amazing party. Lol re hiding things on the closet and swiffing. We just did that last night. My bro is coming and we can’t have him reporting back to the family that we are as gross as we actually are. What a great idea for a party. Im sure everyone ate well. I love making shall the components of bibimbap. That pear cake looks so good too. Mark bitman doesn’t mess around. Enjoy your week. Stretchy pants…so funny 🙂 This looks so delightful and delicious. I love to see how the site has evolved from the first post. Just goes to show that however much one might change, the fundamental motivations never really do! YES YES YES!!!! Oh my god this would make my mom excited, I LOVE all the bibimbap!! And you’ve got all the right things going on in that bowl, makes me swoon. Yes! The answer to everything IS food. This is such a great idea. I’m forever putting together a dinner party as that is probably the only time I would see my friends. It’s such wonderful feeling to watch people get together around food. It’s common ground no matter what your background is. I got off track. This looks amazing my dear, so delicious. This is the coooooolest idea. So fun and creative! Hi! My nam is Anh Landrot Just subribed to your blog today. You got such a great idea to make bibimbap party. One can pick veggie or meat as he/she likes. Your blog is so beautiful! Thank you for sharing. Pan fried crispy rice FTW! Was just waxing poetic about the best bibimbap in LA, but who knew you’d go and make my dreams come true at home?! Love this, Cynthia! I know what you mean about time passing so quickly between gatherings with friends. Part of the grown-up thing I don’t like as much! 😉 This is such a fun idea. Beautiful, Cynthia! This is so exciting! I’ve been meaning to make a pilgrimage to my favorite restaurant for bibimbap, but haven’t been able to get over there. 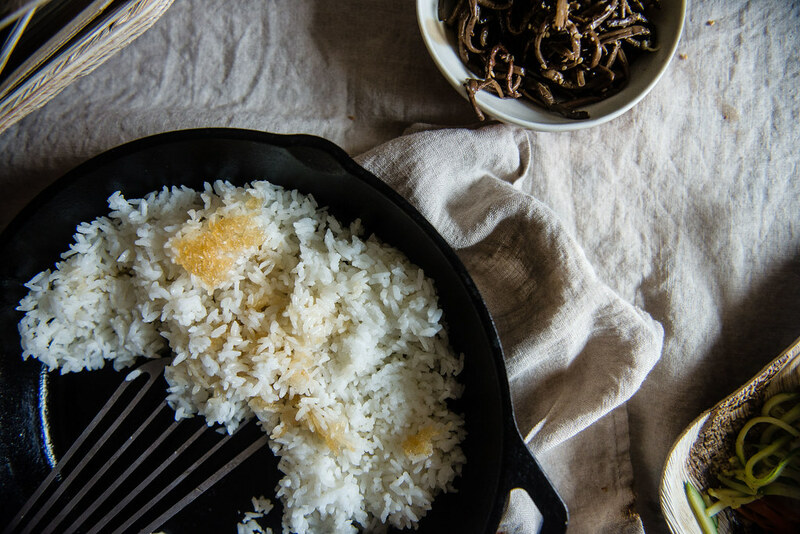 It’s all about that crispy rice! And the sauces, the extra add-ins, the egg and seaweed…. okay all of it! I’m so pumped, because I’m totally making this! And I made it! Oh my goodness it was delicious! And my friends went wild for it, too! The rice got perfectly crispy and amazing, the bulgogi (I used chicken) was insane, everything from the veg to to gochujang sauce was incredible. Yum! Thanks for sharing this with the world! Wow, you certainly know how to throw a party! I love it. i love the lil wooden plates too and how easy everything is to serve at room temp. that’s always my thing, how do you keep things hot? but bibimbap is excellent cause at room temp it’s just as good! Hi Cynthia! I simply love your bibimbap! It was one of the first things I tried cooking when I found your blog recipe. And you know what is funny? 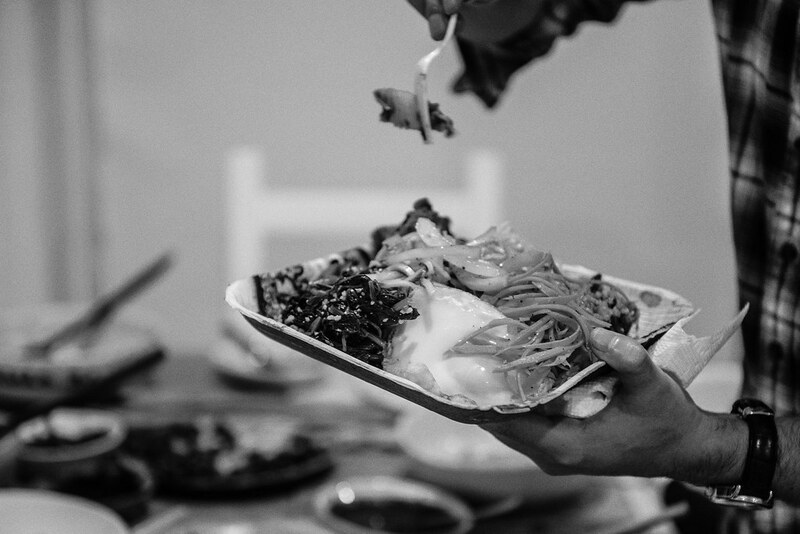 Three weeks ago I invited a couple over (both also kind of expats) and made a Korean evening with bimbimbap and kimchi and…. Your lovely panna cotta with safran cardamom. All turned out amazing and we had a very fun night. Especially when you consider how nice it is to get something different for your palate as we live in Montevideo (I know… Where the f* is that? I neither had heard of it before we moved here for my fiancées job. Well it is the capital of the smallest country in Southamerica, next to Argentina- only 4 million residents). This looks amazing!! How long did the preparation take ;-)? I love the veggie version of bibimbap! Everything about this is so incredibly great!!!!! Killing me softly with this bibimbap…. This reminds me so much of home!! 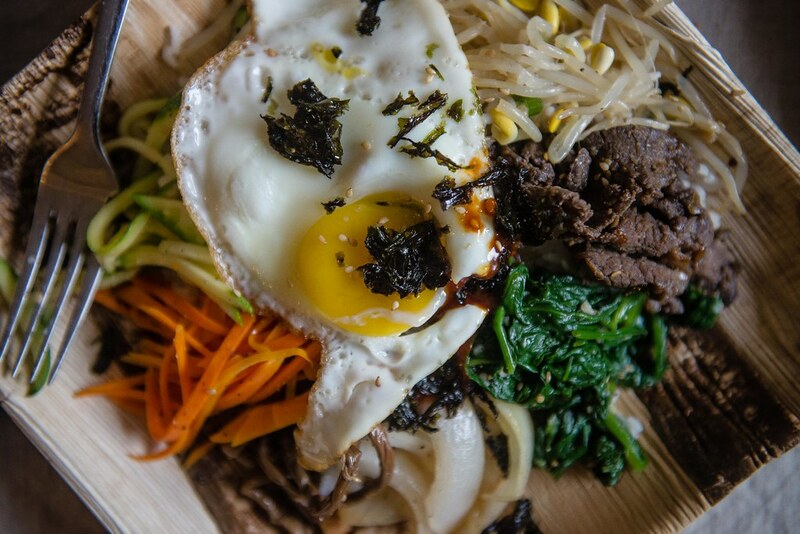 We actually have a bibimbap bar in Charlottesville, basically a Korean version of Chipotle (but called Zzaam)! Alas, it doesn’t compare to the home-made stuff. Bibimbap is one of my favorite things to eat and to say. It’s such a fun word. Bimbimbap Bibimbap Bibimbap. I love it. Ah, and the crisped rice looks so damn good. I’m hardly awake as I type this and now I’m just really craving bibimbap for breakfast. Love this. Love these pictures, everything looks so tasty, colourful and delicious… What a treat! I love this idea so much! This potluck plan is a great way to bring everyone together. I’m definitely a hostess at heart and am actually looking forward to finally moving in with my long distance fella. In fact, we’re planning our first get together as homemade southern brunch! I can’t wait for an excuse to eat *all* the biscuits. ps. everything on this table looks amazingly delicious. Yay! This looks totally amazing – both for the guests and the host. What a great way to catch up with friends. Ah! This looks so fun and tasty. Such a great idea for a party. This post is so exciting because I just went for the first time to a restaurant that serves what I blithely called “Bim-Bim-Bap” in the manner of Fred Flinstone. XD I would love to host a party like this. Thanks for the inspiration! I absolutely need to remember to make this next time I have guests! I like that you separated the instructions out into when they need to be done. That will help a lot! Thanks for posting this! After saving this idea for a long time, we finally had a bibim-bar party this weekend. Everything was SO good, even the plates you recommended were a hit. We used a vintage plug-in warming plate that we picked up from Goodwill to keep the veggies warm and it worked perfectly. Thank you so much for the awesome party plan!